You must be a member of the Dallas Arts & Culture Group to attend this activity. Would you like to join this group? I have attended this event multiple years and it is by far my favorite foodie event. honoring the top restaurant and bar talent in Dallas. 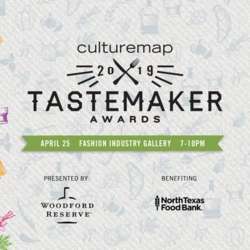 Throughout February and March, we'll be profiling the Tastemaker Awards nominees. Then on April 25th, we'll unveil the winners at a swanky tasting event with an awards ceremony.